I agree. Even though they had cared for him up till now, it seems it was to have an object of pride to show the neighbors. I guess the price of grooming Bing was worth that. As he got older, they probably wouldn't think he was worth the extra vet bills he might have needed. The person who adopts him will know what she is getting in to. 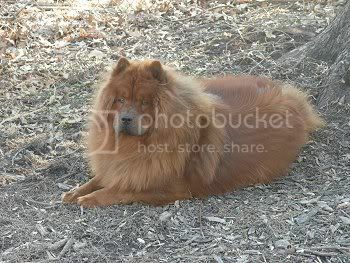 How about this: I have a beautiful red mostly-Chow foster (Max) with the sweetest personality. He is in perfect condition, 4-5 years old - all of the good Chow qualities including a bit of eccentricity but no grumpiness (sorry, Lucy) or skittishness. His owner was moving and "couldn't" take him, so she took him to the vet and told them to put him to sleep (aka "kill him.") The vet wouldn't, so now he is staying with The Herd till we find him a good home. I have tried being charitable about the woman - maybe she had a terminal illness, maybe she was going through a divorce, etc. and thought death was better than grieving or going to a shelter. Probably, she was just an undeserving jerk. I tell Max everyday that I will find him a home that deserves and appreciates him! I really can't have more dogs (The Herd is up to five now) and Pete the mostly Chow and Ming the Shar Pei don't appreciate having Max around and give him a hard time. Lucy, Sally, and Sylvia are fine and will even ride in the car with him. I have some great photos of Max I can share if anyone is of a mind to adopt him. He is in NO danger but my spouse is pressing me to "get rid of him", so sooner rather than later will be good. Plus, he and I are getting attached and I don't want him to feel twice that someone he loved abandoned him. After this, NO MORE RESCUING FOR ME!!! LOL, I doubt from the way you "speak" that the rescueing will stop. Where do you live and can you post pictures of him? You might start a new post so that Max can have the whole post to himself. Also, put him in the rescue forum. I am a member of about 12 forums so I can try to spread the word about him. I have had him posted for a few days on the rescue section. How do I post pictures? Can't figure it out?! I use photobucket.com It is a free photo hosting site. you can also just email me the pics and I can post them for you! If you need me to send you my email again, just let me know! Last edited by Mandy on Tue Feb 21, 2006 6:24 am, edited 1 time in total. I use Glowfoto. That is free also Susan. Glad to hear Lucy is still Lucy. Now you wouldn't have her any different, would you. I am so happy that Bing will be found a new and forever, truly loving home. The saddest part about it all, is these same monsters will get a new puppy to show off after they get settled. Pitty the popular dog of the day! I just wanted to send this back to the top. Bing has not yet found a forever home! He needs someone to love him! Please consider bringing this dignified gentleman into your home. And please cross post his petfinder link anywhere else you frequent. OMG!!! I thought they had Bing adopted out. I could cry. Any word about the Amazing Fancy Mandy? Wonderful Debbie!!! I hope that this works out. Please let them know that you have us as a support network and I would be that if you need to get Bing transported up there that we could ALL make it work. I will do everything I can to help make it happen. There are more than enough of us here online to figure out a way. I live in IL so getting him up further north is possible for me. I know people in MN so I bet we can find a ton of people willing to help. OR maybe a flight is something we could all chip in for. Just make sure she knows we will do everything we can to help you. I will shoot her an email (we have been in contact) and let her know that you are trying to get ahold of her. Gosh, I hope this works out - I wish I could join in - just a little problem of an ocean! I'm not sure how a Chow would be with flying, I think Pekoe would freak but if it would be faster and easier just to fly him from Tenn. to Canada instead of going from car to car person to person, anything could happen on the way. Does anyone know what it would cost to fly him there, (can he be sent alone?) I can either pay or help with the ticket especially since the Chow is going to someone on this site. and when I say i will pay for the ticket that dosn't mean the Chow gets to sit in first class being served coctails and penuts all the way to Canada. I think flying him will probably run about $200 to $250. When I was looking for Lily alot of kennels were willing to ship, and that was the going rate. It's a ballpark estimate. That seems awfully cheap but that's fine, how do I go about this I'm in California, I don't fly, never will, I have only been on a plane once and had to be drugged. 4 double Jack Daniels, 1 screw driver and 2 Halciums (sp) just to get on a plane and I don't even drink. I have been in contact with Susan about Bing also, so make sure she knows that I am still open to fostering if need be. I got an email from Susan today and she is still screening, so like Mandy said, make sure Susan knows that you have all of us as a support network and then also about Jeff's offer. Thank you Jeff... you are an absolute sweetheart! Judy Fox wrote: Gosh, I hope this works out - I wish I could join in - just a little problem of an ocean! I hope so too.. Bing is a great dog and I hope he gets adopted by people who will love him the way he deserves to be loved. I got an email from Susan yesterday, so when I replied this morning, I made sure she knew we were 100% behind you in adopting Bing and also mentioned Jeff's offer of paying for air transport from Tennessee to Canada. I am so excited for you. This sweet boy needs a loving FOREVER home. Hummmmm my email to Susan got bounced too. I don't get it. I haven't had a bit of problem sending email to her until this morning. Must be something with their server. I'll try again later on when I get home from work. That is SO very generous of you! I really hope we can all make this happen. I would be happy to help chip in too. I can't do much but I can definitely help out. Jeff&Peks wrote: I'm not sure how a Chow would be with flying, I think Pekoe would freak but if it would be faster and easier just to fly him from Tenn. to Canada instead of going from car to car person to person, anything could happen on the way. Does anyone know what it would cost to fly him there, (can he be sent alone?) I can either pay or help with the ticket especially since the Chow is going to someone on this site. and when I say i will pay for the ticket that dosn't mean the Chow gets to sit in first class being served coctails and penuts all the way to Canada. Most chows are fine with flying, I flew MingToy and LiChi from Vancouver WA to Minneapolis, MN after my mom passed away and I adopted them, also both Darkwind and Firesong were flown up from Texas, poor Darkwind had to change planes 3 times! He was a little thirsty and nervous but okay, some water and a walk and he was fine, he flew has frieght. Firesong just wanted out of that crate and to run, walking her through the airport was an adventure! She flew as baggage as did MingToy and LiChi. With the new rules about pets not being allowed to fly in severe tempertures it is now safer to fly them.